Get the most out of Timberline. Attend a breakfast meeting! eting! hroughout Sage’s history, their commitment to customers has been at the center of everything they do. As a Sage Authorized reseller, CPA Technology’s objective is to reflect their commitment onto our customers in order to help them reach their business goals. Sage will be extending that commitment further later this year with enhanced products, new services, and productivity-enhancing features. One of the most visible elements affecting our customers will be the introduction of new names for Sage products that will make clear which products are most appropriate to complement the Sage solutions you are using today, and which may be available to support your business as it grows. As part of Sage’s brand strategy in an effort to align U.S. branding with the European division, a new product numbering system will be put into place (think of some of the luxury car brands). If you see any of these names floating around, you will know which they apply to: Sage Timberline Office is becoming Sage 300 Construction and Real Estate. Sage Master Builder is becoming Sage 100 Contractor. Sage Timberline Enterprise is becoming Sage 300 Trade Specialty. Sage MAS 90/200 is becoming Sage 100 ERP (Standard/Advanced). What is CPA Technology doing about this transition? 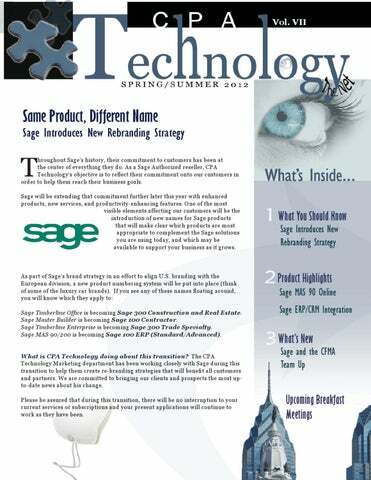 The CPA Technology Marketing department has been working closely with Sage during this transition to help them create re-branding strategies that will benefit all customers and partners. 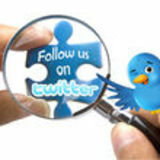 We are committed to bringing our clients and prospects the most upto-date news about his change. Please be assured that during this transition, there will be no interruption to your current services or subscriptions and your present applications will continue to work as they have been. A CRM (Customer Relationship Management) solutions helps establish a positive, consistent experience when customers interact with your company. An ERP (Enterprise Resource Planning) system helps you manage the financial and operational aspects of your business. Linking these systems together can create new ways to increase customer satisfaction, improve cash flow, save time, me, and earn a better return on your investments in sales, marketing and customer er service activities. With Sage CRM and Sage ERP integration right out of the box, companies can quickly and easily create seamless workflows between the front nt and back office. easily accessible from multiple locations? When these two powerful solutions are combined, your employees company-wide wide have access to all the information they need in order to provide customers with th exceptional service, without delays. In sales, your staff can easily check the availability vailability of stock across different locations and check the real-time status of orders without thout having to log on to different systems or call someone in another department. Your sales on, easily team also benefits from instant access to comprehensive customer information, retrieving real-time status on orders, availability of stock, invoices, customer payment history and more. The integration also allows your marketing team a greater insight into the customer base. Better promotional campaigns and offers can be designed with the information they can retrieve about buying trends, suitable target markets and other customer purchasing behavior. Finely tuned ed marketing programs can lead to higher response rates and new leads. To find out more how your company can build a better purchasing experiencee for your customers, call us for a brochure or speak to Fred at (610) 862-0039. Sage MAS 90 is becoming Sage 100 Standard ERP in the Fall of 2012. It’s very easy to get starting with Sage ERP MAS 90 Online. Give Fred at CPA Technology a call for more information at (610) 862-0039. Sage and the CFMA Team Up for Unprecedented Partnership Some things just go so well together. Sage announced late last year, a new partnership between Sage CRE and the Construction Financial Management Association (CFMA), an international professional non-profit association focused on the educational needs of financial professionals in the construction industry. With Sage CRE becoming a major sponsor of CFMA, the acceleration of development of timely, relevant educational content will fulfill the specialized learning needs of thousands of financial managers and professionals within the construction industry. Through this partnership, Sage will sponsor many of the existing CFMA educational programs, as well as fund the establishment of the Sage Educational Fellowship which will develop new educational programs, opening many more learning opportunities to its association members and the broader construction community. To extend the partnership even further, every new Sage CRE customer’s opportunity to join the CFMA is sponsored by Sage for the first year. The membership affords its members valuable networking opportunities, free webinars, live education courses, among many other benefits. Wednesday, Apr April p il 4 4,, 2012 12 Sage S age MAS 90 Distribu Distribution buti tion on M Management anag an agem emen entt Register online at www.cpatechnology.net/masdemo.html www.cpatechnology.net/m /ma asdemo.html Look Lo ok ffor or m more oree sch or scheduled hed dulled d live live web web demos demos in the near future!